This video is part of the appearance, “Cisco UCS Presents at Tech Field Day Extra at Cisco Live Berlin“. 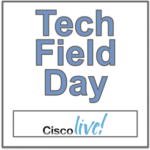 It was recorded as part of Tech Field Day Extra at Cisco Live Europe 2016 at 11:30 - 12:30 on February 17, 2016. Raghu Nambiar, Distinguished Engineer, discusses the impact of big data on information technology today and gives and overview of how Cisco approaches solution sets for customers who are looking at implementing big data and analytics.